Conventional wisdom about mushrooms dictates that you keep them dry -- brush them off instead of soaking or rinsing -- and then cook them quickly in a hot pan without crowding. The reasoning is that mushrooms act like tiny sponges and soak up water if you get them wet. Since mushrooms contain so much water, if you crowd them in the sauté pan, or don't cook them quickly, they'll steam instead of browning. As often happens with so-called kitchen wisdom, though, this mushroom myth is wrong. Many food scientists and writers have realized some time ago that the first element of that belief is incorrect. The fact is that, like most vegetables, mushrooms have a high water content ​to begin with. Soaking them in water may add a tiny amount of water to their weight, but compared with their beginning water content, any added amount is inconsequential. The second belief has been more tenacious. Even though the resident geniuses at New York's International Culinary Center and the blog Cooking Issues debunked the myth a couple of years ago, you still find well-respected (but mistaken) authors and chefs perpetuating the mistake. As ICC's Dave Arnold and Nils Noren explain, a bunch of wet, crowded mushrooms in a pan will start out as (in their words) "a soupy mess." If you cook them long enough, though, the water evaporates, at which point they'll brown beautifully without absorbing the oil you're using. Dry mushrooms, on the other hand, are very porous. When you heat up a pan with oil or butter and add dry mushrooms, they soak up the fat and never let go of it. You end up with browned but greasy mushrooms. As an added bonus, the "wet, crowded" method also turns out mushrooms with a much more concentrated flavor, especially noticeable with commonly cultivated mushrooms. Begin by cleaning the mushrooms. Since it's clear that there's nothing wrong with soaking mushrooms, that's the way many clean them, being a fast and thorough process. If you've got a colander that fits into a bowl, you can place the mushrooms in the colander, put it into a bowl in the sink, and fill with water. Let them soak for a few minutes, swishing them around with your hands if necessary to get them clean. Then just lift the colander out and drain them. You can also soak them directly in the bowl, then pour into a colander -- although if the water is very dirty, you'll be pouring the dirty water over your ​clean mushrooms, and you will probably want to rinse them again. When they're clean, trim and cut the mushrooms. Keep in mind that with this cooking method, the mushrooms will lose volume and end up quite a bit smaller than they start out. Add water, fat, and salt. If you shop at a market where mushrooms are only available in 8- or 16-ounce packages, you probably know how difficult it can be to use them up before they start to get slimy. When you're cooking for two, this can lead to lots of waste. Another great thing about this cooking method is that since you want a crowded pan, it's actually better to cook a big amount at once. As soon as they're cooked, you'll see how easy it is to use them up. Choose a saute pan that will fit all the mushrooms two or three deep. Remember, you want them crowded for this method. Add enough water to barely cover the mushrooms. For eight ounces of mushrooms, add about a tablespoon of butter or oil and a teaspoon of kosher salt. Put the pan on a burner turned to high and bring the water to a boil. Keep the mushrooms at a boil. 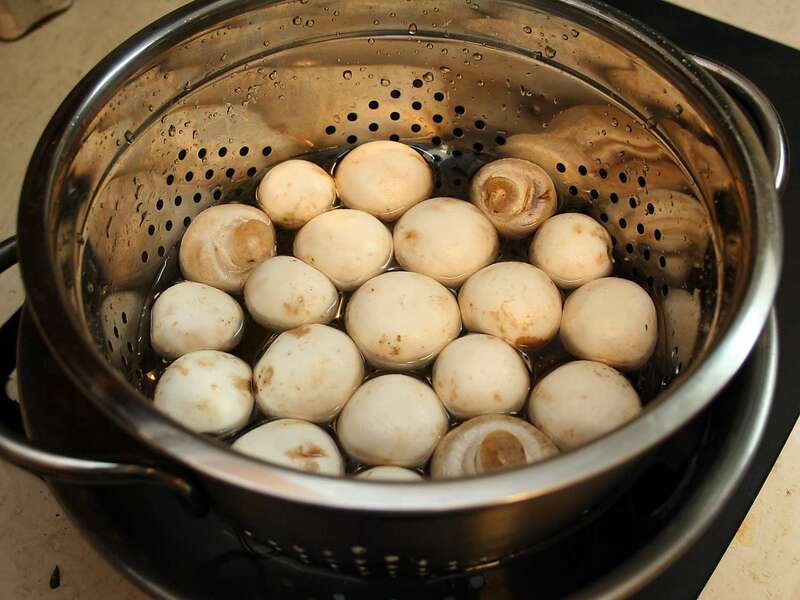 When the mushrooms come to a full "rolling" boil, you can turn down the heat, but keep the burner adjusted so that the water continues to boil, not just simmer. You'll notice that the amount of water in the pan is now greater than what you added to start. That's because as the mushrooms cook, they're losing much of the water from their cells. At this point, you can ignore the pan and go on with dinner prep; you're just waiting for all the liquid to evaporate. As long as you're in the kitchen, your ears will tell you when you need to pay attention to them again. When all the water is gone, the mushrooms will begin to sizzle. At this point, it's easy to brown them in the oil or butter that remains. Since the mushrooms are already completely cooked, this stage doesn't take long. The beauty of this method is that the cooking process has caused the cells in the mushrooms to collapse and lose air and much of their water, so they don't absorb any of the fat in the pan as they brown. It also concentrates the flavor and improves the texture as well. This is the point where you can season the mushrooms if you wish. You can deglaze the pan with a little wine or dry sherry. In omelets or scrambled eggs. With spinach in a quiche. Tossed with sauteed green beans or snap peas. On pizza or in pasta sauce. In risotto or rice pilaf (where they pair well with peas).